The slip at the shallow part of the megathrust triggered the destructive Tsunami associated with the Tohoku Earthquake in 2011. Thus, it is important to understand how such a large rupture can take place in sedimentary sequences. Sawai et al. (2014) investigated the dynamic frictional properties of incoming sediment off the Japan Trench. 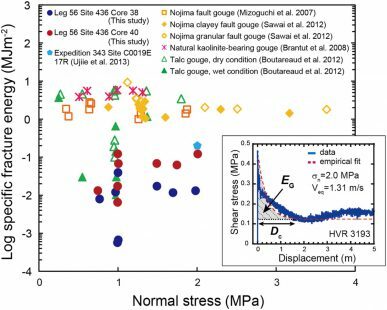 From the experiment with a wide range of coseismic velocities, they found that the friction coefficient is less than 0.2 for a wide range of slip velocities in a smectite-rich zone at the bottom of the sedimentary section, which is equivalent to the fault zone of the Tohoku earthquake. Most importantly, this study showed that the fracture energy of aggregated sediments was by far lower than the ones obtained by the previous experiments using disaggregated sediments. This is an important finding for the generation of shallow rapture. The first author contributed significantly to this excellent study that will be leading a research in a new direction by combining seismological and geological sciences. Thus, Dr. Michiyo Sawai is deserving of the EPS Young Researcher Award 2016.